20" scrubbing path, 92 lbs. This 20" dual speed floor machine is a full range buffer. The low speed turns at 180 RPM, and the high speed turns at 320 RPM. It can do all the things that our low speed rotary buffers can do, and most of what our high speed burnishers can do as well. The motor and transmission on this dual speed machine are the same extra heavy duty components that come on the Trusted Clean 20" HD floor machine. The only difference is this machine can switch to a higher speed to help spray buff your tiled floors. 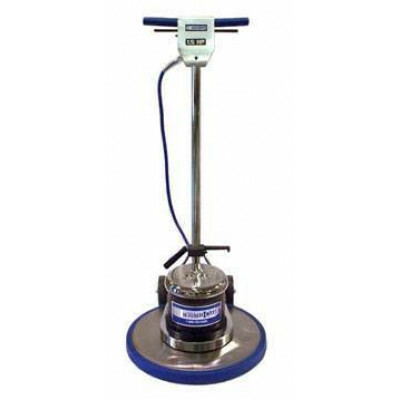 The Trusted Clean 17" dual speed floor buffer is the little brother to this model. These 2 machines both come with a spectacular 3 year warranty on the power train, and 1 year on parts and labor! For different sized machines, or ones with more options, please take a look at our complete line of dual speed floor buffers. All steel triple planetary high speed transmission. Extra thick, chrome plated handle tube. Stainless steel apron with am all metal construction. Double safety switch levers located on a fully adjustable handle. Non-marking PVC bumper protects surrounding walls, doorways, & furniture. Dual speed switch located on the apron for ease of use. DC rectified (plug into AC outlet), permanent magnet 1.5 hp motor, low amp draw. 3 year warranty on motor and transmission, 1 year on parts and labor. Customers who were interested in the Trusted Clean 20" Dual Speed Floor Machine (180 & 320 RPM) were also interested in the following items. This is a review for the Trusted Clean 20" Dual Speed Floor Machine (180 & 320 RPM).